For a Limited Time! Save 25% on the Stampin' Up! Starter Kit! Every stamper knows that the best gift at Christmas is a box full of Stampin' Up! goodies. How about being able to get that box AND all future boxes of goodies at a discount?? Just think, paper, stamps and ink all at a savings! Ends Dec. 2. 25% off! The $99 Starter Kit will be discounted to 25% to just $74.25. You can order your kit through me here! Your time is limited! The special ends Dec. 2. Build your own kit! Choose up to $125 worth of Stampin' Up! products for your kit including On-line Extravaganza Sale items, 15% off Bundles and the Clearance Rack. That's over $50 in free product! Stock up and save even more! Once you join, you receive a one time 30% discount on a product order of $150 or more if placed within 45 days of joining. 20% Discount? Yes, please! Enjoy a minimum of a 20% demonstrator discount every day. 5% Bonus exclusive to this special: Receive a 5% cash back bonus on all personal and outside sales in December. This is in addition to your regular discounts and will be paid in January. Ahead of everyone else? With your demonstrator status, you will be able to pre-order products from the new Occasions Catalog and be able to earn Sale-A-Bration gifts. No Risk Here! You will have until April 30th to try out the benefits of being a demonstrator. If you reach $300 in sales by the end of that first full quarter, you will renew and be active for another quarter. If you don't reach $300 in sales, you can drop with no penalty. NO Obligation Whatsoever! You never have to hold a workshop, party, sell products to others or make any other purchase beyond the kit. Doesn't this just scream try me?? Best thing ever... are you someone who loves to stamp and just wants to get your Stampin' Up! items at a discount?? I welcome Hobby Stampers! As part of my down-line, you will be a part of the Stampin' Pretty Pals. This is a great group of people who are a constant source of inspiration and fun. Want to know more about my stamping background and why it would be fun to join my team? Click here. Ready to join my team and have some fun? Purchase the starter kit here! Save up to 50%! Don't miss out on this amazing sale. Click here or on the image above to take you to the Extravaganza. These items can also be chosen as part of your starter kit. It doesn't get any better than that! Specials end Dec. 2. I can almost smell the pine needles! Even though I love non-traditional colors used for holiday cards, it is easy to be in love with the more traditional colors. After I stamped the top panel, I die cut the word Noel from that panel and then cut 5 (yes, 5) more layers of the word Noel from the Real Red card stock. I glued all of them together. This is how I achieved the raised area. I somewhat offset the last red layer, just to give it a bit more pop. And yes, the red speckles are from the Gorgeous Grunge stamp set. That set never leaves my stamping table, do you have it?? I colored rhinestones with the Cherry Cobbler Blendabilities to add just the right amount of sparkle. Don't forget, the Blendabilities will dry on non-porous surfaces. One other card made with this stamp set with a bit of Gorgeous Grunge mixed in. This one is a bit quicker to make, but still quite lovely. Product list below. If you are reading this blog post via email, you may have to click on over to my website to see the product list. The Stampin' Up! 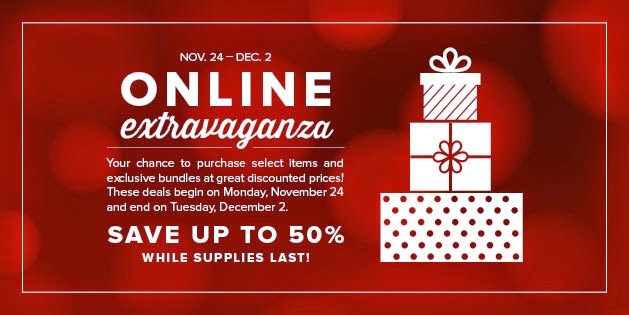 On-Line Extravaganza Sale Starts This Monday!! Preview the sale items HERE and start making your list. The sale runs from Monday, Nov. 24-Tuesday, Dec. 2. Up to 50% off many items plus door buster specials. And yes, I think before you shop for everyone else on your list, you should gather up all the things to you need to finish up your holiday projects and maybe even help your hubby with some of his gift buying! After all, what could be better than Stampin' Up! for Christmas?? 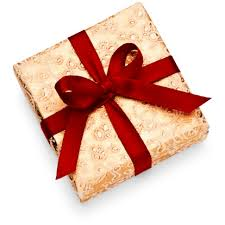 There are some great deals on punches and ribbon, not to mention a ton of other great items. The Best Way To Save $$$ on Stampin' Up! The Stampin' Up! Starter Kit will be 25% off. (Starts Nov. 24) Normal price is $99 for $125 worth of product with free shipping. With this promotion, the kit is 25% off. This special ends Dec. 2. I welcome hobby stampers! Joining Stampin' Up! does not require a commitment to be a working demonstrator like myself. Please contact me with any questions. My email address is stampinartfully@gmail.com and my phone number is 417-396-5488. Want to know more about my stamping background and why it would be fun to join my team? Click here. I know..."grungeful" really isn't a word. (I googled it). However, I was thinking if you mixed joyful and grunge, it could almost be a word. It is absolutely what comes to mind when I see this card. You may have seen the anniversary card from yesterday using a similar technique. (click here) This is a bit more of a stepped up version and I dearly love it! If you do not own the Gorgeous Grunge stamp set, run, don't walk to the little "shop now" button below and let me help you become addicted to it like I am. I use so many of the different images as enhancements to my projects, I almost never put it away. The pictures do not do this card justice. It is SO much better in person. I have had many of you who have seen this card ask me exactly how I did it. I am working on a similar design using the Noel die cut and I will post some step by step photos along with that sample in the next few days, so sign up to get updates from my blog to make sure you see that post. I will also be posting a few other ideas mixing these Framelits and that stamp set. Both need to be on your "I must have it now" list. Don't forget about all of the yummy goodness that is 25% off this week! Yesterday was our anniversary. Yep...been married 33 years to the love of my life. He is amazing and completely supports my addiction to rubber stamps and all things artsy. With him in mind, I came up with this simple card. I think the neutral colors give it a more masculine feel. I saw a card on Pinterest that totally inspired this piece. I colored the rhinestones with Crumb Cake Blendabilities! 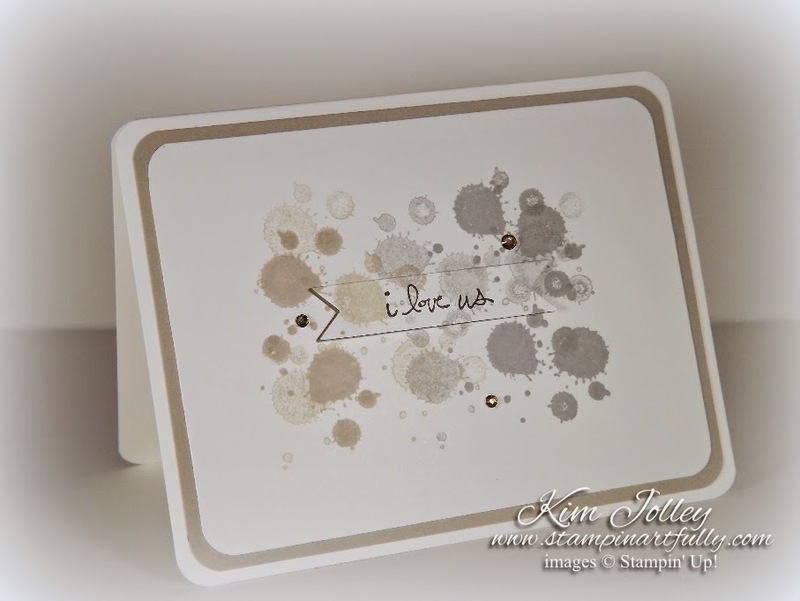 I think the Blendabilities are one of the most versatile products Stampin' Up! came up with this past year. You can customize so many of your embellishments and other non-porous surfaces, not to mention coloring your stamped images with them. I achieved the splatter look with just one stamp from the Gorgeous Grunge. After initially stamping the image with either Crumb Cake or Smoky Slate ink, I stamped it a few more times without re-inking it. Can you imagine? The items below are a whopping 25% off this week. Don't waste any time grabbing these "must haves" for your stash. Hope your day is filled with wonder & creativity! 1. What projects am I currently working on? I am constantly working on cards and 3-D projects for workshops, events and for giving away to friends, family & clients. I am really loving vellum & anything with bling and glitter right now, so you might say I "sparkle" a bit. Today is my anniversary. My husband and I have been married 33 years. Below is a sneak peek of the card I made him, which will be featured in a blog post tomorrow. 2. How is my work different from other papercrafters? Well...I don't know that my work is truly that different. I say this because I know I am strongly influenced by other artists I see on my favorite blogs and on Pinterest. However, many times, it is just a layout or color combination that I am influenced by. When I do the actually creating, it is more me than them. Of course, there are times when something is just TOO good not to CASE. The card above is quite like something I saw on Pinterest. I loved it so much, I had to put my spin on it and make it for my hubby. 3. Why do I create the projects I create? Creating for me is an integral part of who/what I am. I also love sharing what I create, learn or "come up with", with others. This is why being a Stampin' Up! demonstrator is such a good fit for me. When I am getting ready to come up with a new project, I normally will sit down with a cup of coffee and browse Pinterest. Not just to look at other cards or crafts. Many times, it is to look at other types of artwork, such as paintings, sculptures and drawings. I also love to look at websites like Anthropoligie. Sometimes it's a plate or a vase that inspires the layout or colors on a card I make. Sometimes it's a layout in a fashion magazine that inspires me. Above all else, I love the creative process and adore happy accidents. Wendy Klein was born in Bismarck, North Dakota, but was raised from the age of two in the Front Range of Colorado. She spent the first sixteen years of her adult career as a Legal Secretary/Paralegal, and is now an Engineering Aide with Lockheed Martin Space Systems Company following in her father's footsteps and carrying on the family tradition of his 29 years at the company. Wendy is a creative soul who has always needed something to stimulate her creative juices, first pursuing embroidery, cross-stitching, scrapbooking, basket-making, and teaching herself to crochet; later a long-time "surrogate mom" taught her to quilt, and this has become her passion and first love. During the past decade of pursuing her love of sewing, she discovered rubber stamping and paper crafting, and the Studio now serves as the sewing room and a place of pure stamping pleasure! Wendy is thoroughly enjoying sharing her love of cards and creating with others, and spends most of her free time in her little Studio creating designs and dreaming of the next fun project. With the Holidays coming, she is looking forward to crafting special gifts for all her friends and family. Check out Wendy's blog www.doggonedelightfulstampin.com to see for yourself. Then check out her post next Monday to see her discussion of how she works. I hope your day is a creative one! Come back tomorrow for the details on the anniversary card I made for my hubby. Feathers are everywhere...just look at Pinterest. I needed to make a birthday card for my dear hubby and I had been wanting to try the baby wipe technique too, so these cards are the result. The matching die cuts and magnetic Big Shot platform make this look a snap to put together. The middle feather was stamped using the baby wipe technique. 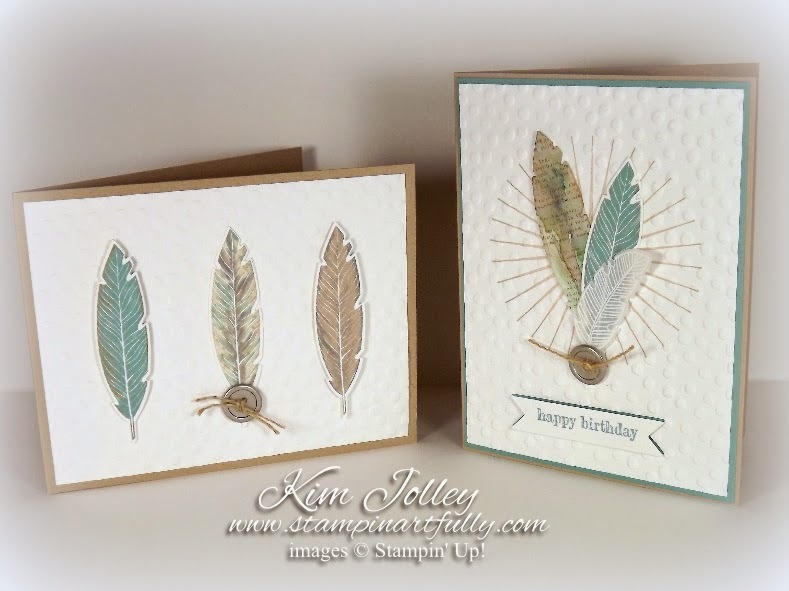 The outer 2 feathers were colored with the regular Stampin' Up! Markers. I watercolored a piece of Stampin' Up! 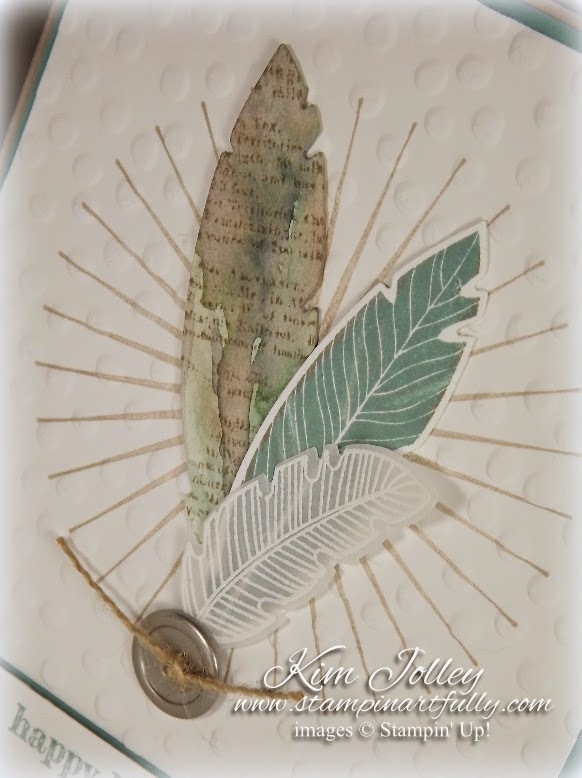 watercolor paper, stamped on it to give it depth and die cut the feather in the back. The middle one was another one where I colored the stamp with markers before stamping. The front feather was stamped and embossed on vellum. Welcome to the Pals Blog Hop for November 2014, where we will be sharing projects with a thank you or Thanksgiving theme. You may just be starting the blog hop or you may have come from Debbie Crowley's Expressively Deb Blog, #27 on the Pals Hop. If you get off track at any time, the full line up below will help you move along from blog to blog so you see all of the amazing creations. I just love how this turned out! 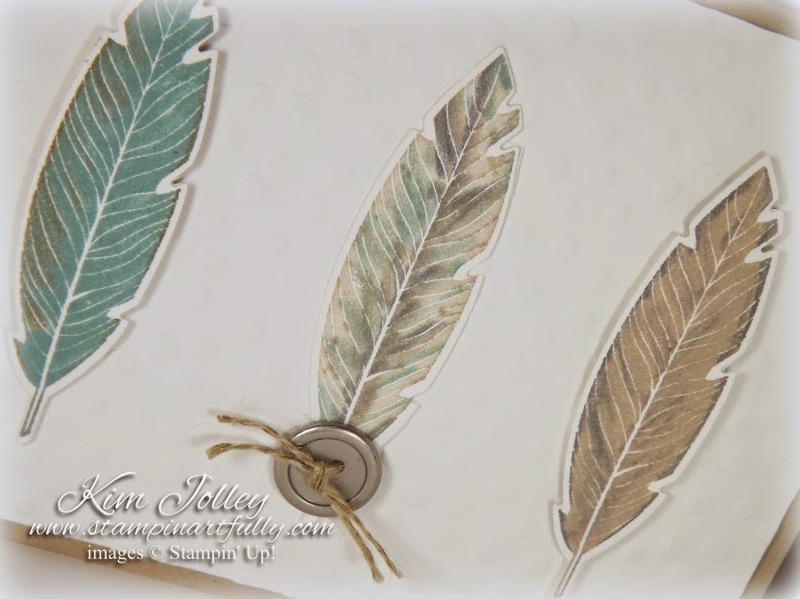 The combination of the feather stamps with the wreath die was a late night brainstorm. 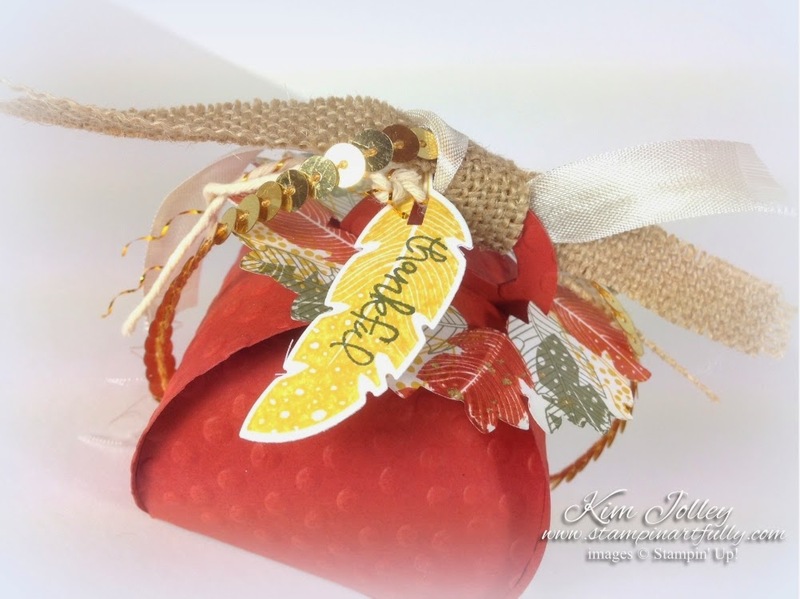 Your next stop on the blog hop is Sue Becker's RnR Stamping Blog,, #29 on the Pals Blog Hop. You will soon figure out that the Ornamental Pine is my new favorite stamp set. It is SO versatile. I thought the little snowflake sequins were a perfect touch! Be thankful for this day. When I have a creative block, these are my "go to" colors. Isn't this card simply stunning? 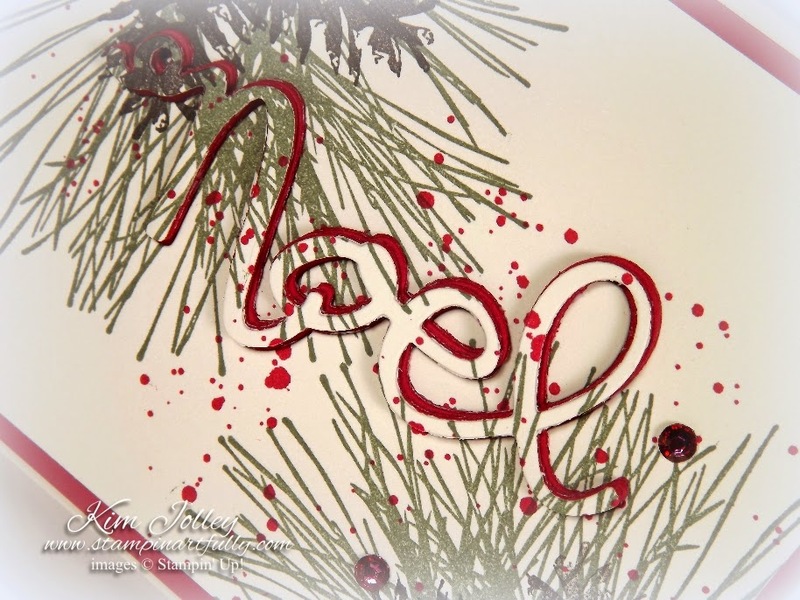 If you don't have the Ornamental Pine stamp set, it is a must have! Christmas Bliss and New Weekly Deals! The chill in the air is really making me think about getting ready for Christmas. I adore Thankgiving, but Christmas is the real prize! Here is a simple card that could be easily duplicated to make several in one sitting. 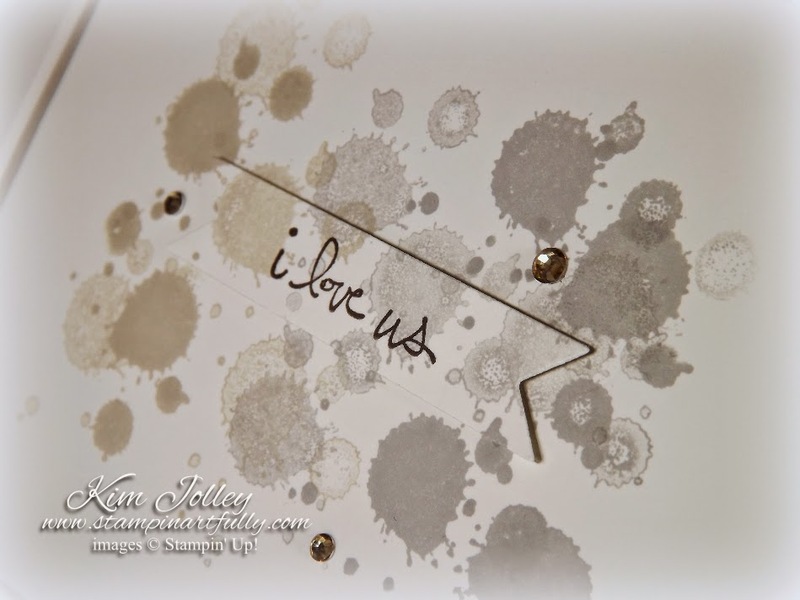 Vanilla Shimmer Smooch Spritz gave this card just the right amount of sparkle. If you don't own it, you are missing out! New Weekly Deals started yesterday and end November 10. Save 25%! Check out the latest goodies Stampin' Up! has on sale. This is a great time to stock up on these items. Follow this blog or follow me on Facebook, Pinterest or Twitter to keep up with my latest news, events and projects. Links on right sidebar of this page.